It’s a big world of content marketing tools out there. Half of them you’ve never heard of, and the other half of them, well, you’re probably sick of hearing about. And just a friendly heads-up: I love some of these tools so much I’ve partnered with their providers to get the word out about them. That means that if you should think some of these tools are just plain amazing and sign up to use them, I’ll get a small kickback from their providers when you do. (You don’t pay any extra—the companies are pretty much just paying me for doing the heavy-lifting marketing for them.) I’ve indicated which tools I’m affiliated with by adding [Affiliate] to the listing. This is one of my all-time favorite tools. You can use it to see how many people are searching for certain search terms, and you can also see how people are finding their way to your competitors’ sites! I used this tool when researching how to rank #1 for Christian apps. Plus, it gives you plenty of heads-up when it comes to helping your site rank better in search engines. This tool gives me plenty of ways to constantly improve my site—it can do the same for yours, too. This is one of those tools that makes you feel giddy when you use it for the first time. 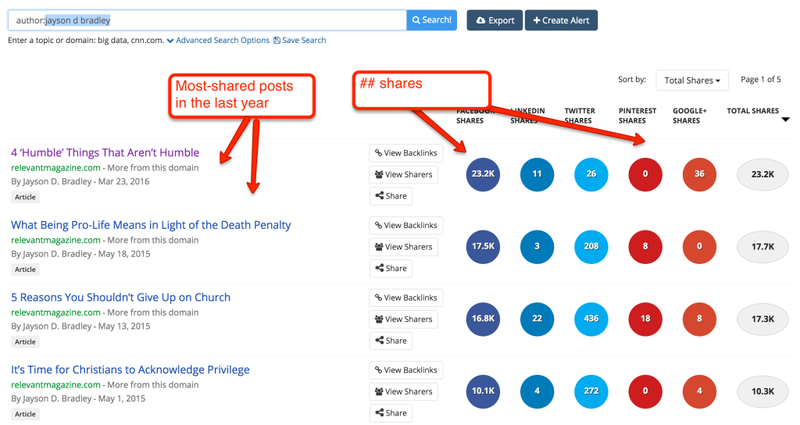 Buzzsumo is pretty much the SEMrush of social media. It lets you see what people are sharing on major social networks. It shows you which voices are emerging on various topics. 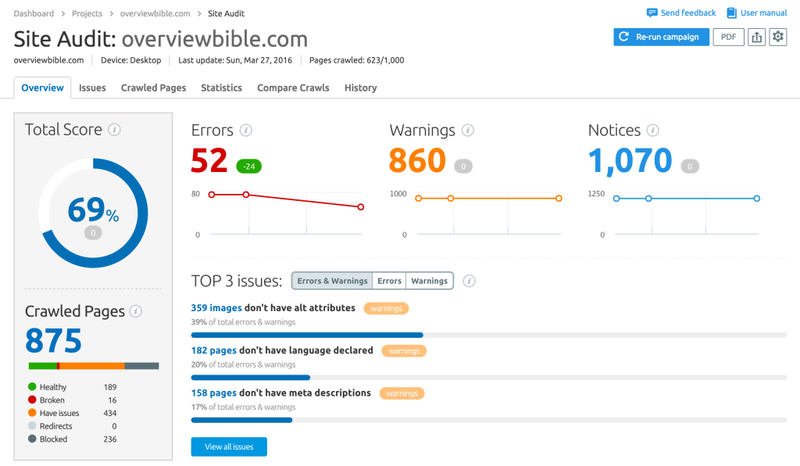 It also shows you what the most popular pages on a given website are—and just how popular they are. It’s golden if you’re using it to have conversations with influencers or aspiring authors. If an agent comes to you to pitch an emerging author with a very popular voice on social media, you can look that author up in BuzzSumo to see just how popular they really are. For example, lets say someone pitched you a book idea from blogger Jayson D. Bradley. The agent tells you Jayson is a popular blogger with young Christian audiences and has a voice that challenges the church to engage culture in a Christ-centered way. You could take the agent’s word for it. Or you could look him up in BuzzSumo and get the hard numbers yourself! OK, so you have 10 amazing books on leadership in your backlist. You know they’re still relevant books—no chapters on beheading the sons of your rivals. You just aren’t sure when to blog about them or post to social media in a way that brings these books to attention. Huh. Looks like interest in leadership tanks around Christmas every year, but for the most part, it’s constant. Good to know, right? It’s the bare minimum tool for calculating search volume. I greatly prefer SEMrush, but if you want unlimited reports and don’t want to pay for them, this is the bottom-line way to go. This part of the list addresses tools that will help you turn website traffic into email subscribers (or possibly purchasers). I recommend this because both MailChimp and WordPress are really popular. If you’re already using them both, this is a quick-and—not-necessarily-dirty way to start turning blog visitors into email subscribers. If you need an all-in-one marketing platform, that’s what HubSpot is built to be. It gets really pricey really quickly, and I honestly haven’t had a great experience with their in-house customer success team. But if you want one platform to handle pretty much everything (and not be too hard to use), this is the way to go. I won’t go into this too much in this section, as Marketo is first and foremost a marketing automation platform. But I can say you can build landing pages, forms, and all that great stuff in Marketo. This little tool is still in beta, so as I write this it’s still a little buggy. But I love the vision behind this tool. It’s a landing page builder that lets you create landing pages for specific mobile devices your audience is using—and test those designs to see which is performing best. Again, this is the all-in-one marketing platform. If you have a decent backlist, then HubSpot can be the platform you use to automatically ping your readers recommending more books to buy. It’s powerful, and probably one of the easier platforms to learn to use! Anything you can think of in terms of automating marketing. Seriously. I mentioned these guys before. When it comes to content marketing automation, they’re the king. Multi-triggered automated sales campaigns? Done. Lead scoring and progressive profiling? Done. Behavior-based messaging? Done. Once you master it, you will feel like a superhero. Nay, a cosmic marketing demigod. But the power you get from Marketo—it’s dramatic. The ability you’ll have to market your backlist will blow you away. I’ve been a Buffer user for a while (and I’ve done some freelance work for them). They’re committed to giving people a simple, intuitive way to share content via social media. And their support team is top-notch. I use MailChimp—and a lot of other people do, too. They’re the way to go if you just want to get started with sending email without paying an arm and a leg. There are plenty of email marketing platforms out there. Emma is more than just a platform, though—they’re like an extension of your marketing crew. They’ll develop custom templates, train you for success, and all that good stuff. Yes, I suppose it can be. But it doesn’t have to be—especially if you’re sending super-friendly videos to your contacts. BombBomb helps make email a lot more personal by allowing you to send videos directly through email—and quickly, too. Obviously, there are a lot of tools that I haven’t listed here yet—but I plan to revisit this article every month or so to dump in more tools, use cases, etc. Any tools you’d recommend for helping publishers with content marketing? I’d love to hear about them in the comments!